Check out booking steps below before you proceed to booking page. 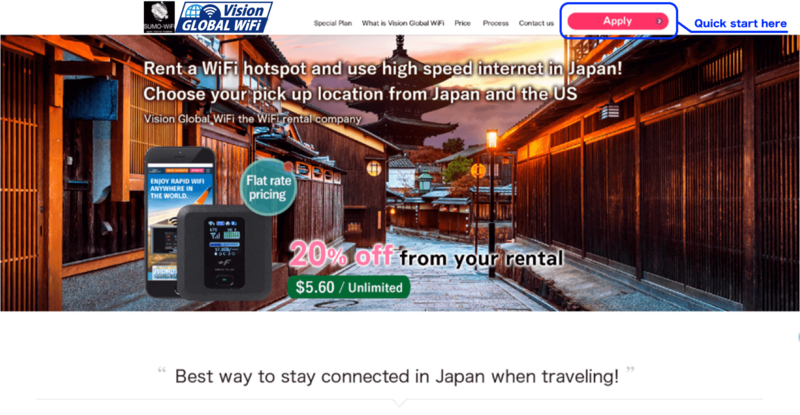 Here are 4 steps to book a reasonable pocket WiFi at VISION Global WiFi. 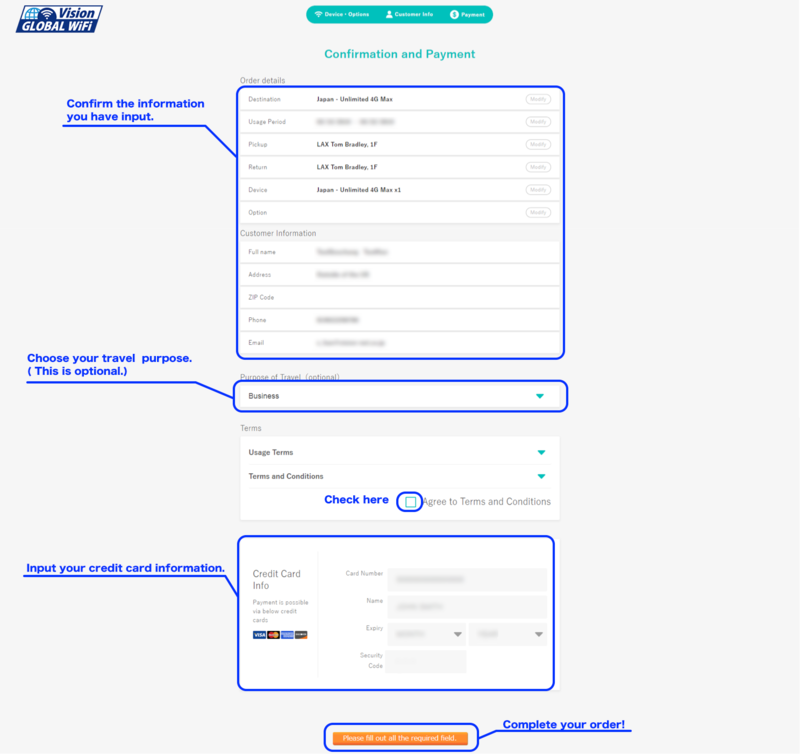 In order to proceed to booking page, click the button at right-top with red border. Please choose country(Japan),Departure and Return date , plan , and so on. “Unlimited 4G MAX” plan has no high speed data cap, so it is highly recommended. We recommend getting the “100% coverage” insurance plan. If the pocket WiFi is lost there will be a $400 charge for the device and SIM card fee. If it’s your first time ordering please register your information. 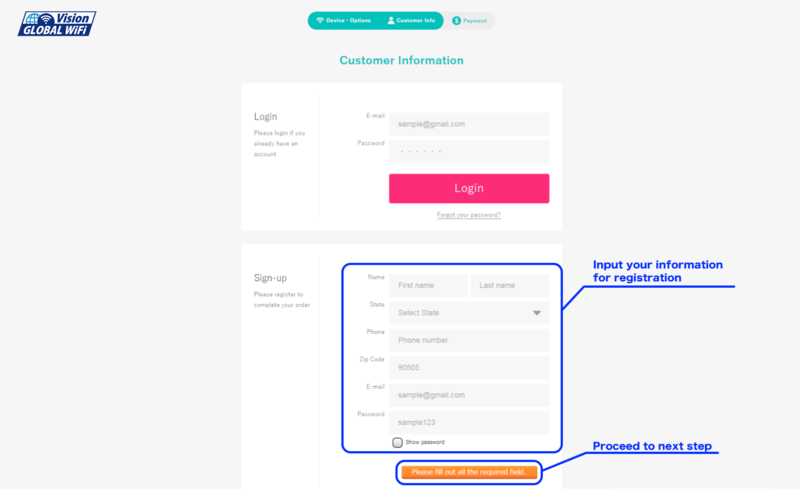 Please confirm the information you have input,and check the box and input your credit card information to complete the order. Until when can I cancel an order? Is there a cancellation fee? Cancellations can be made free of charge up to five days before the usage period. Please contact customer support for cancellation inquiries. Unfortunately, cancellations occurring within 4 days prior to the start of the usage period will be charged 100% of the total fee. From what point does the rental period begin? The first billing day will the date that you depart the US. If you opt to pick up the device at the destination country, then the first billing day will be upon pickup. Payment is only possible via credit card (VISA, Mastercard, Amex, JCB, Diners, Discover). Registered corporate clients may also be eligible to pay via invoice.